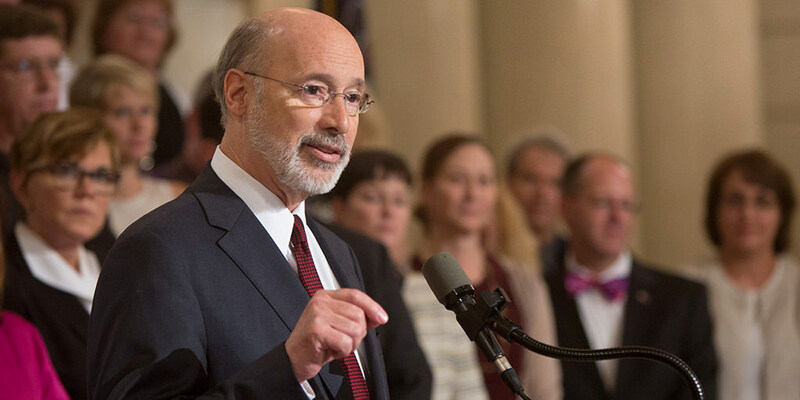 Harrisburg, Pa. – Governor Wolf today urged the General Assembly to consider an important set of bills aimed at providing Pennsylvanians with the tools they need to prevent and fight the heroin and opioid epidemic. These bills would limit over-prescribing, further regulate recovery homes, require opioid education in schools, and provide a humane path to require treatment. Last year, Governor Wolf signed five key bills that became law. Senate Bill 472, introduced by Sen. Yaw, limits prescriptions for a controlled substance containing an opioid to seven days unless there is a medical emergency that puts the patient’s health or safety at risk. The bill, among other things, also requires all prescribers who are licensed, registered, or otherwise legally authorized to distribute, dispense, or administer a controlled substance containing an opioid to discuss the risks of addiction and dangers of overdoses associated with the medication with the patient or family. Sen. Tom McGarrigle introduced a bill to allow the Department of Drug and Alcohol Programs to regulate recovery houses that receive federal, state, or county dollars and serve individuals in recovery from substance use disorder. The commonwealth currently has no jurisdiction over these facilities. House bills 121 and 1190, introduced by Rep. Aaron Kaufer and Rep. Joanna McClinton, respectively, both address prevention education in schools. One would require mandatory education for students in grades six through 12 with an emphasis on prescription drug abuse, the power of addiction, and heroin. The other requires mandatory education for heroin, methamphetamines, and other drugs from kindergarten through grade 12. Each includes involvement by the departments of Education and Health to develop curriculum and train teachers. There is work in progress on an amendment to Senate bill 391, introduced by Sen. Jay Costa. The legislation amends the Drug and Alcohol Abuse Control Act (D&A Act) to reflect mandatory evaluation and treatment provisions included in the Mental Health Procedures Act (MHPA), allowing an individual to be subject to mandatory evaluation and treatment if the individual has a substance use disorder and is incapable or unwilling to accept voluntary treatment and the individual presents an imminent danger or imminent threat of danger to self or others within the past 30 days. “To ensure a win in the battle against opioid addiction, we need to give more tools to the people on the front lines – and often, those people are the families of people fighting addiction,” Sen. Costa said. “Not only do they have to watch their loved one suffer with addiction, but there is very little they can do to get them into treatment. “My legislation allows parents, guardians or spouses to petition for mandatory commitment so that a loved one would be effectively treated for opioid addiction.